Wat Suthat is a first grade royal temple, one of six such temples in Thailand. 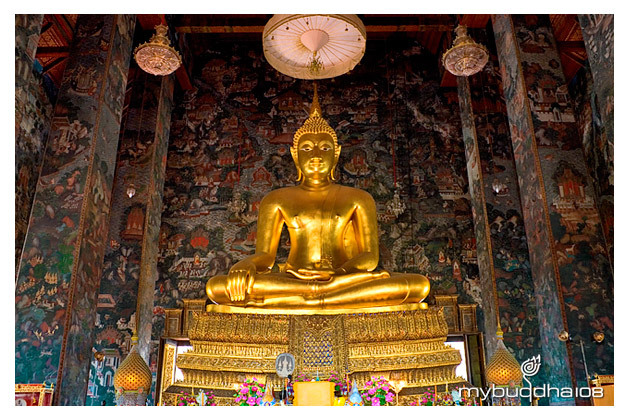 Construction was begun by His Majesty King Rama I in 1807 and completed until the reign King Rama III in 1847. An official temple of King Rama Vlll of Ratanakosin period housing his majesty sculpture within the compound. Wihan house "Phra Phuttha Si Sakayamuni" as the principal Sukhothai Buddha bronze image Subduing Mara posture. Around Wihan stand 28 selection of Chinese pagodas on the 6-tier basement representing 28 Lord Buddha. Ubosot (Ordination Hall), which is quoted for the longest of its kind in Thailand, houses "Phra Phuttha Trilokachet" as the principal Buddha image in the Subduing Maha posture. This temple is noted for its super murals in the main chapel as same as Santa Maria Delle Grazie which is acclaimed of its frescoed painting of Leonardo da Vinci's.